When I was growing up in an orphanage in St. Petersburg with spina bifida, my only way to be mobile was to walk on my hands. I had no other option. As a child, I would try to keep up with the other kids solely using my hands for movement. This article’s author, Tatyana McFadden, after winning the women’s 400 meter T54 final at the Rio 2016 Paralympic Games. For me, being mobile was key to my happiness: without it, I simply couldn’t join in. That quest for mobility has been with me my entire adult life. After I’d been adopted and moved to the US, my high school said I wasn’t allowed to do track sports simply because I was in a wheelchair. I didn’t take no for an answer, and neither did my adopted mom, Deborah, who took my case to the courts. That case eventually led to the Fitness and Athletics Equity for Students with Disabilities Act in Maryland. That landmark piece of legislation became federal law. It means that across America, students both with and without disability who never dreamed of competing in athletics teams are able to do so. I fought in the courts and in the statehouse because for me, mobility is freedom. I want that freedom to be extended to more people, and this is where technology can help. Yet, for all the incredible advances we’ve seen in technology in recent years, mobility devices for many people with disabilities remain stuck in the past. If we think of the innovations in motor vehicles or computing in the same period, it’s hard to argue that mobility devices have kept pace. And that’s not for a lack of ideas either: lots of people have great ideas how to improve mobility for people with disabilities, but it’s a tough market to get into and regulation is often burdensome. This is why I’m backing Mobility Unlimited, a $4 million global challenge to transform the world of people with lower-limb paralysis. We’re looking for the world’s creative thinkers from inventors, technologists, designers and engineers, to come forward and submit their ideas on how we can improve mobility for people with lower-limb paralysis. The challenge offers 10 $50,000 grants to people with a good idea: five finalists will be awarded $500,000 to develop their concepts, and the winner will receive $1 million to turn their idea into reality. I’m proud to be part of this journey and cannot wait to see the winning device unveiled in Tokyo in 2020. Throughout my life, I’ve always thought that — whether disabled or not — we all go through challenges. Taking on challenges is an important part of living life to the fullest. When I said at 14 to my adoptive parents that I wanted to be an Olympic athlete, they said, “Ok!” and we started training. A year later, I was the youngest member of the American Paralympics team in Athens. You may doubt whether you can create a new invention that people can use, but if you do have a concept that could change the world for people with lower-limb paralysis, I say, “Seize the day!” There may be more hype around Bitcoin, but innovators could have far more impact if they turned their attention to how they can make the freedom to move available to all. We simply can’t let technology leave people with disabilities behind. 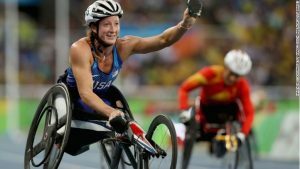 Tatyana McFadden is a seven-time gold-medal-winning Paralympian and an ambassador for the Mobility Unlimited Challenge, a global challenge seeking new innovations to transform the world for people with lower-limb paralysis.